Round 24 was at Railway on the Barford complex. With 13 members turning out the bowl would be in and that’s where you don’t want to be. With clear blue sky and no wind it was going to be a hard day we were thinking. And hard it was for some. Venue expert Kevin Lawson came first with a narrow 12oz win this week. Kevin fished peg 6 (all our pegs) and weighed 20lb 12oz. 2nd goes to last weeks winner, Mark Charlwood who fished peg 8 for 20lb dead . And third was Dave Paynter. 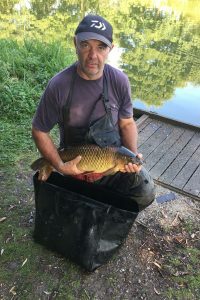 Dave fished peg 2 and weighed 19lb 2oz. So a big well done to them. The 4 who fished in the bowl had a real struggle all day 2 didn’t weigh and the other 2 only had just over 20lb between them. It was a day to forget. As you can see from the weights it was very hard today. Let’s hope next week is much better at The Old Stables.